creative free motion quilting I want to do, where easy movement of the quilt is needed. Here is my newest triptych: Old English Garden 2. This triptych has a short story…..I had made Old English Garden triptych about a year ago. 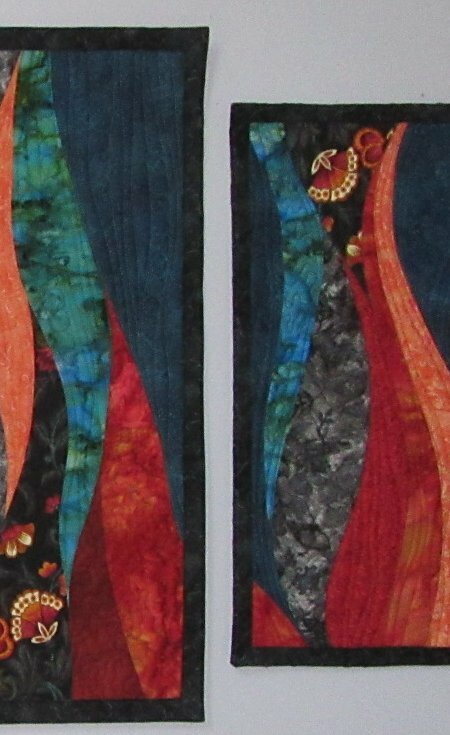 I listed the quilts as a triptych OR to buy individually. Someone bought the middle quilt and after about 6 months with just the smaller quilts in my shop, I decided to make another middle quilt and return these three quilts to a triptych. I believe the colors and design really glow in the triptych arrangement though I know the larger middle quilt is a beauty by itself also. This new “quilt” will only be sold as a triptych. Thankfully I still had all the fabrics from the original three quilts so making the middle quilt again wasn’t too difficult. It is similar to the original but since I don’t use patterns, there is some variability. One of the fun challenges of triptychs is that I like to make the pattern and colors carry over from one quilt to the next. I’ve attached two close ups of the transition sides of this triptych so you can see how the curves and colors transition. This is a bit tricky when I’m piecing…especially without any patterns. I like the effect of drawing your eyes across the quilts as you enjoy the colors and curves. I’ve attached a picture of one of my other triptychs to see how art quilts can be created in this design style in a landscape art quilt.